True to expectations, Neil and Anne chose for our meeting one of New York’s now numerous, rather expensive, cult-inspiring coffee shops. We met at Café Grumpy, on 20th Street in Manhattan. The couple was predictably, almost professionally, excited about the coffee we drank there. The way they talked about coffees reminded me of the way fashion fanatics talk about a new pair of shoes, fresh off the runway. They sip the newest products, rather than slipping them on their feet, but the oohs and the ahs are similar, and the appreciation of quality and value invisible to most outside their particular circle of friends and fellow coffee connoisseurs. I found myself (chagrinned) wondering how much I had been missing, all this time contenting myself with Porto Rico‘s affordable Fair Trade Organic coffee, brewed eight cups at a time in my old drip machine. Fair Trade, I was informed, is Neil and Anne’s least favorite certification. They search out the highest quality beans, the acquisitions of direct trade routes, the treasured products of local roasters held in as high esteem as the most inaccessible, high-end designers. I was in for a lesson. Anne Nylander and Neil Oney are the organizers of the New York Coffee Society (NYCS). Founder Daniel Humphries established NYCS just over a year ago, in March 2007, for the sole purpose of facilitating the appreciation of high quality coffee. 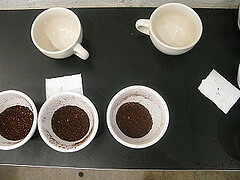 The Society organizes events – cuppings – at which the general public has the opportunity to try coffees in a non-commercial environment. The cuppings are generally free or donation-based. They take place once a month, in all different places, highlighting coffees from various farms and roasters. No one is paid to put on the events, and no products are available for purchase. Anne became co-organizer of the New York Coffee Society in January 2008, and Neil naturally became the “third half” of the group’s leadership. She is from Seattle, had her first espresso when she was twelve, and has been in love with coffee as long as she can remember. She decided to make a career of it two years ago, worked at Joe and Café El Beit, and attended countless trade shows and regional competitions. In June, she started up TempTamp, a barista temp agency that hires high quality baristas and offers temporary barista services and barista training and consulting to businesses in New York. While Anne and Neil went on a road trip last year ostensibly known as the “road to epiphany,” she admitted, “it was really sort of a coffee crawl.” Asking Anne to explain her obsession with coffee was somewhat like asking her to explain her personality. The characteristics of the quality of coffee sought out by the NYCS are more numerous and complex than I can be even begin to outline. High quality, Anne explained, is somewhat equated with sustainability and social responsibility, since the quality of coffee increases directly with practices considered responsible and sustainable: the beans are shade-grown, grown at high elevations, often organic, and cultivated in a bird-friendly manner. Numerous certifications and business models can guarantee one or more of these characteristics, including the Rainforest Alliance and Bird Friendly certifications and the Direct Trade process of purchasing coffee. The heroes of the Direct Trade process are Geoff Watts of Intelligentsia Coffee & Tea and Peter Guiliano of Counter Culture Coffee. Both Counterculture and Intelligentsia are roasters that have invested in the quality of their coffee as well as the social stability of their sources. They establish long-term contracts with their farmers, providing incentive for a long-term commitment to sustainable practices. As Anne explained, it’s otherwise safer for farmers to produce commodity coffee despite vulnerability to price fluctuation. Many countries have protective markets for the coffee crop, but the specialty market provides an alternative option. Farmers are otherwise inevitably subject to price fluctuation or government protection. Although specialty coffee farmers grow less product, they earn more, and can actually manage to make a profit, as opposed to the majority of coffee farmers, who struggle to break even. There are many more specific elements, of course, within the demands of the coffee connoisseur. Once picked, coffee beans must be depulped, fermented or dried to dissolve the mucilage, dry- or wet-washed, and then dried to 12% moisture before packaging. Then they are roasted. Then ground, then brewed. While the beans will stay fresh in their green form for up to nine months, they don’t fly very well once roasted, and should be consumed within two weeks of their roasting date. Neil explained, “Coffee is like wine before roasting: it’s fermented, the terroir is important, and it lasts a long time. But after roasting, the beans are more like a cheese. Roasted beans are susceptible to air and moisture, and need to be brewed before too long.” Good roasters will always put the roasting date on their bags, and will normally ship the coffee to their customers the day after roasting. According to Neil and Anne, beans are best brewed within fourteen days of this date.